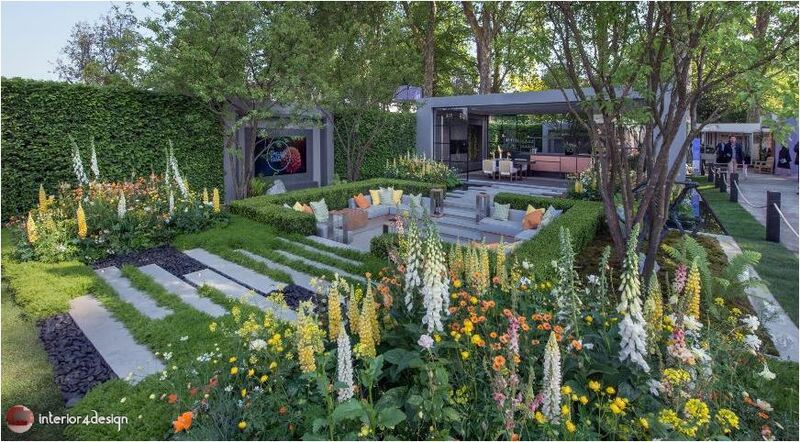 This year, the organizers of the show - the Royal Society of Gardeners - prepared several surprises for the visitors and participants of the exhibition, the main one of which is the introduction of the new contest nomination Space to Grow (instead of the former category "Fresh gardens"). Designers presented, how it is possible to refine and tastefully with the taste, and also on a maximum to use small придомовые spaces. No matter how small your garden, there are always a lot of fresh ideas that inspire creativity, help to awaken fantasy and realize what was conceived in practice. In addition, the 2018 was a record year in the number of women designers who participated in the show for all 105 years of its history. 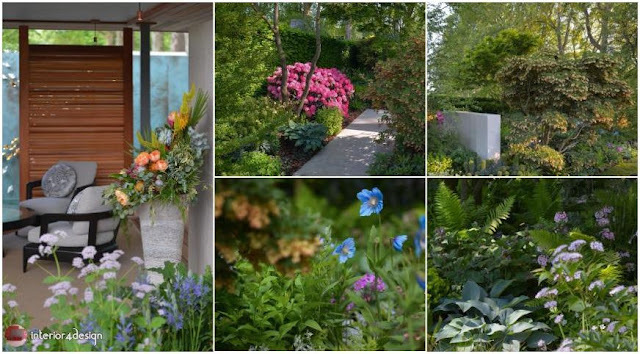 Of the 26 gardens chosen by the Royal Horticultural Society for presentation to the show and the struggle for gold medals, 12 were designed by women. 1. 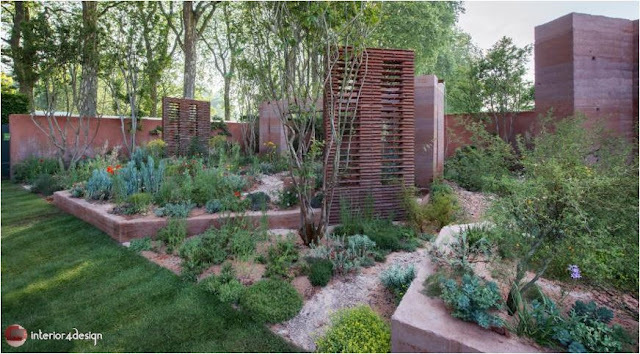 The jury's best garden was recognized by the Chris Berdshaw garden for Morgan Stanley, which is dedicated to the work of the National Society for the Prevention of Child Abuse (NSPCC). It shows a difficult transition period in the life of a small person. At the very beginning of the journey, the direction of the movement is vague and vague, but the forest path leads us to a more open and quiet place, filled with textured perennials in soft, soothing tones. In the depths there is a spectacular pavilion made of cedar wood. The back of the pavilion is closed and bounded by an elegant pond. 2. 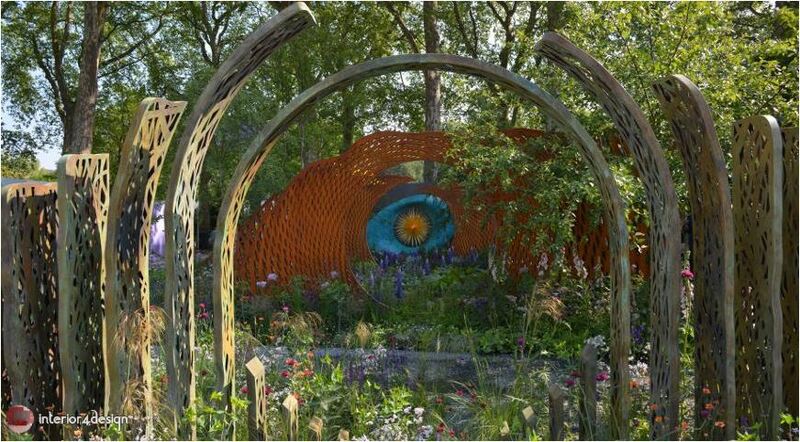 The Audience Choice Award and the Chelsea Gold Medal in the "Exhibition Gardens" nomination went to the Welcome to Yorkshire Gardens reflecting the landscapes of the Yorkshire Dales National Park with vast valleys of valleys, stone walls, a water cascade and a stream. 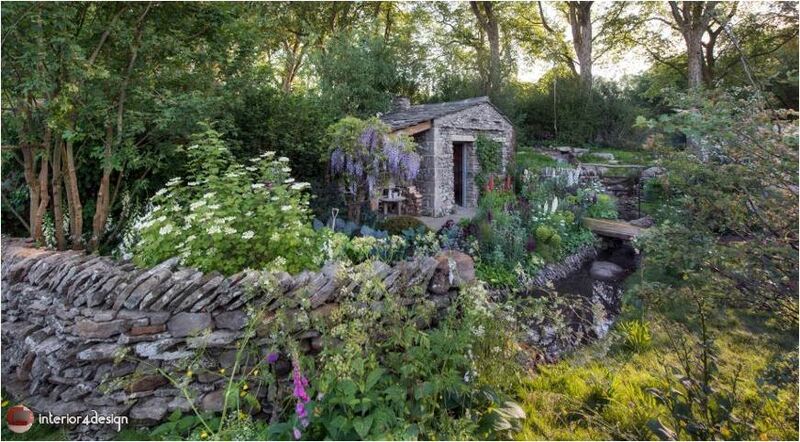 This place, located in the northern part of the UK, is famous for the white and blue Wensledale cheeses, so designer Mark Gregory presented a cottage garden with a private cheese making workshop. 3. A lot of positive responses were received and the Mediterranean garden of Sary Price for the company M & G Investments. By combining plantings, a place for rest and shelter in the form of walls, the designer created a harmonious, beautiful and cozy space. Colors, textures, reflections of light and directions of shadows speak their own language, thanks to the talented use of vegetation and materials typical of the southern arid region. The sprawling crowns of old and gnarled pomegranate trees contrast with the smooth winding barrels of the camprethia, while the annual pink and scarlet poppies coexist with the golden wade and tender green milks. 4. Another winner of the gold medal in the main competitive nomination of Chelsea was the garden of Joe Thompson. The Wedgwood Garden is a modern interpretation of a place for relaxation and tea drinking in the bosom of nature. 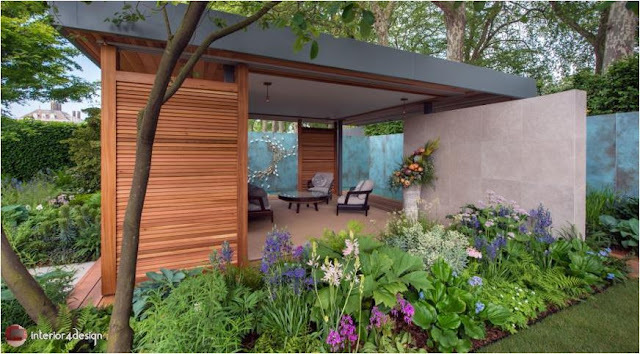 The garden is designed for a woman: an ephemeral bronze pavilion is led by an inconspicuous path, drowning in greenery. The pavilion seems to dance over a stream of water, wriggling amidst harmonious landings, rocks and boulders. 5. 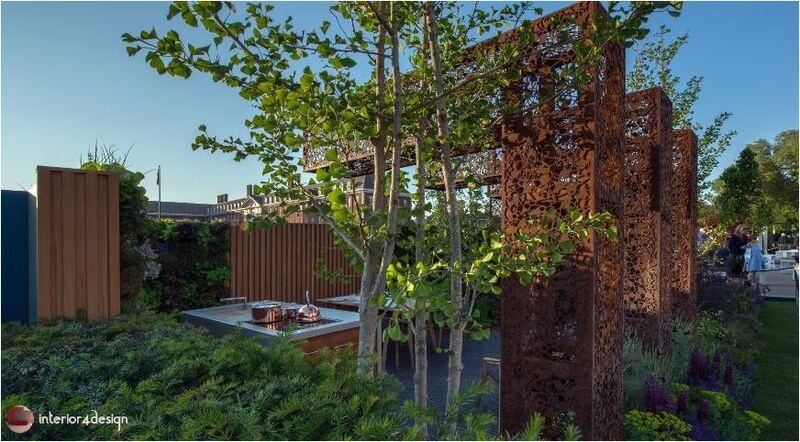 The Garden of LG Eco-City Garden, which received the gilded medal of Chelsea, is a space for a family holiday, an apartment with a kitchen, from which access to a landscaped green terrace is available. Korean designer Hay-Yon Hwan reflected our dependent position on modern technology and focused attention on a caring attitude to the environment. Plants provide the production of oxygen, control the humidity, temperature and consume carbon dioxide. Streaming water neutralizes urban noise, and the contours of trees soften the strict architectural elements. Successful combinations of wild plants, perennials and meadow grasses show concern about reducing the number of insects and pollinating plants. 6. 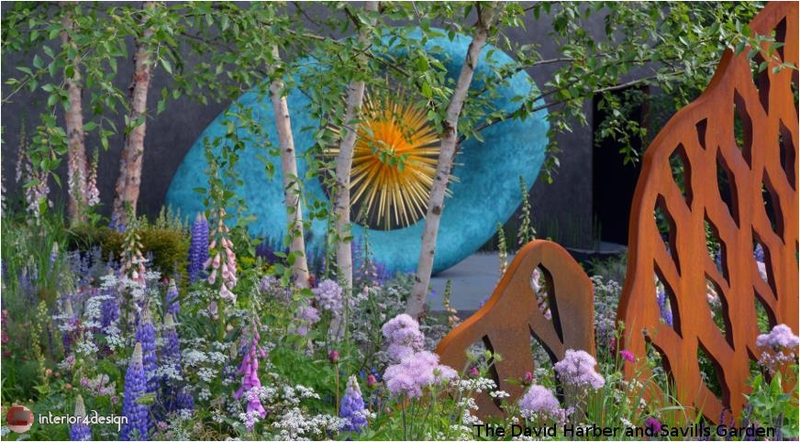 One of the most attractive and photogenic gardens can be called the garden of Nick Howard The David Harber and Savills Garden, received a bronze medal. This is a real garden theater, the main roles in which were given to the unusual sculpture and planting. Different zones of the garden represent the development of human relations and the environment. 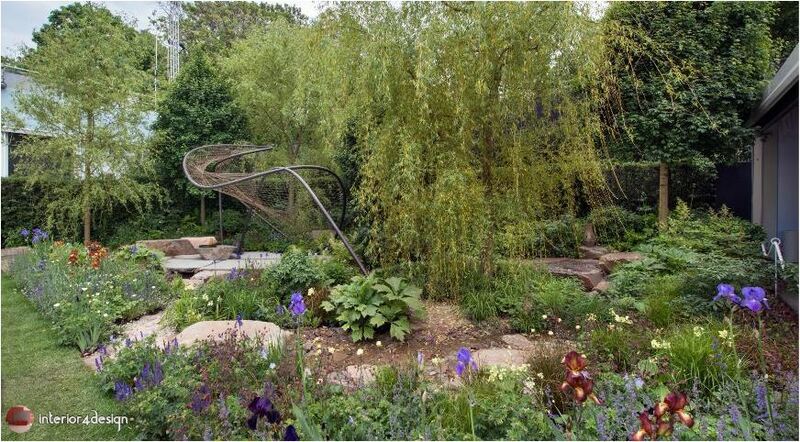 At the beginning of the garden, planting and elements of free natural form prevail. Herbs and perennials conquer the gravel surface and symbolize the natural landscape. Here on the scene appears birch black, its branches with peeling bark are very architectural. In the course of time, the sculptures develop geometrically. The evolution of man is traced in the riot of landings, which seem to get out of control. Lupins, peonies, hosts, geraniums ... 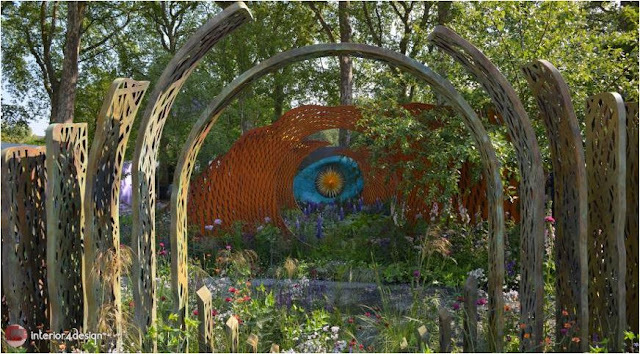 In the depths of the garden there is a bright sculpture, which symbolizes the core that keeps our planet in balance. 7. The best in the category "Natural Gardens" jury chose the traditional Japanese garden Kazuyuki Ishihara O-mo-te-na-shi no NIWA. 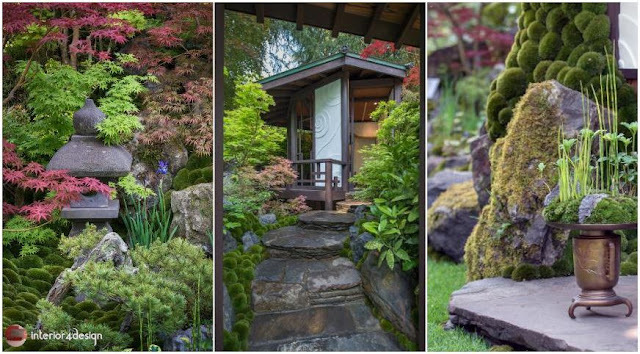 The garden is inspired by the culture of omotenashi - the so-called Japanese hospitality, which combines exquisite courtesy with the desire to preserve harmony and avoid conflict. Hospitality is a way of life in Japan. It permeates all spheres of everyday life, and is taught to him from an early age. 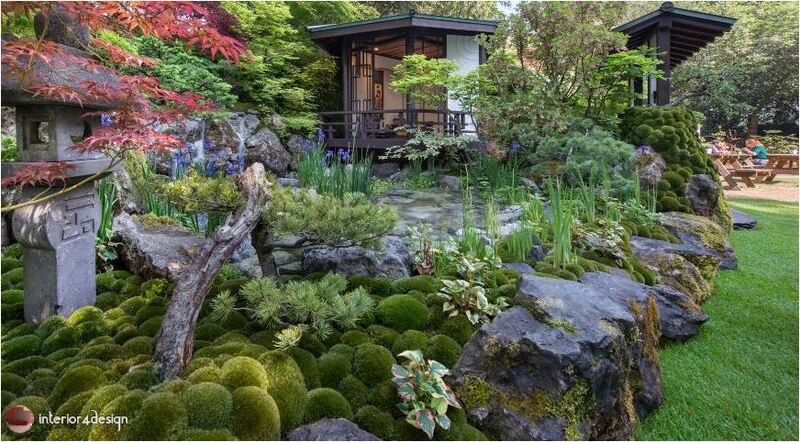 Everything in the garden is permeated with the desire to settle this feeling at a garden party. Landings are organized according to the Ikenobo system - a type of Japanese floristics dating back to the 15th century, in which the placement of plants and their color combinations are considered in conjunction with the landing site. 8. The prize of audience sympathy in this nomination went to the garden of Janine Krimmins The Claims Guys. This is a real garden of contrasts, a triumph of craftsmanship and traditions inspired by the English art movement of the Victorian era of "Art and Craft". It is designed to pass the test of time both physically and aesthetically, while remaining beautiful beyond time. 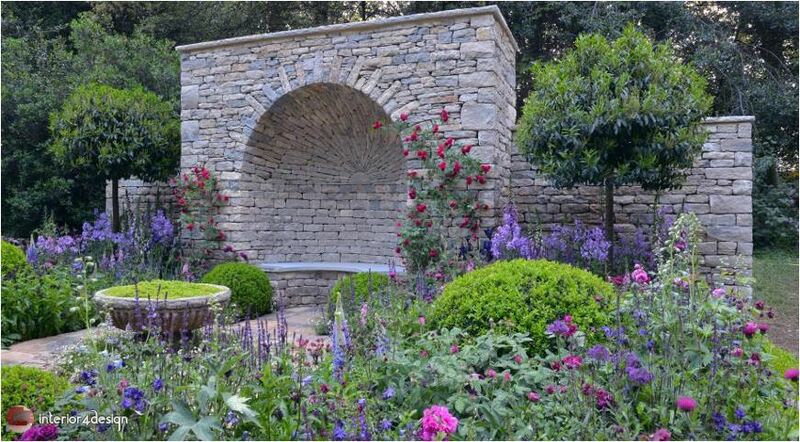 The central point of the garden is a niche in the wall with a vault in the form of a dome, from which a beautiful view of the garden and planting opens. Particularly effective are contrasting color combinations of plants, where digitalis and phlox predominate. 9. 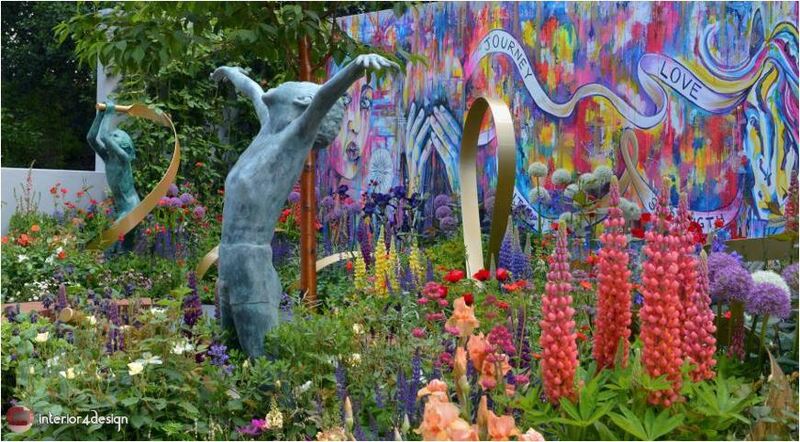 One can not fail to mention the garden of Laura Anstiss, who tells about the work of the Supershoes charity fund in the direction of supporting children in the fight against cancer. The back wall is made in the form of an art object and demonstrates how the fund uses art to lift the spirit of a sick child. Sculptures represent children and their families. The tape stretches across the garden, linking all the elements together, the bench is a place for communicating with friends and medical personnel. The golden color of the ribbon symbolizes the disease, while the colors of plantations, among which perennials and roses prevail, give strength to survive the hard times. The mosaic ornament contains words about families in which children are struggling with cancer, and reflects a mixture of emotions and difficulties before the unfamiliar and frightening. Bright colors raise the mood and stimulate children to do painting. 10. Bold design decisions, bright combinations of plants, skillful functional zoning of space - all this is professionally combined in a small urban garden of Urban Flow Garden, presented in the new contest nomination "Space for cultivation". The garden, recognized as the best in this nomination, was designed by Tony Woods using water management technologies, taking care of the environment. Plants for the garden were carefully selected according to habitus and foliage color in order to provide decorative seasonal effect, they are also resistant to unpredictable climate changes, drought and flooding. The key plants of this garden are: rose bluish, Australian baptism, Canadian dern, ginkgo biloba. 11. The spectators in this category also did not agree with the opinion of the jury and preferred the garden of David Neil The Silent Pool Gin Garden. 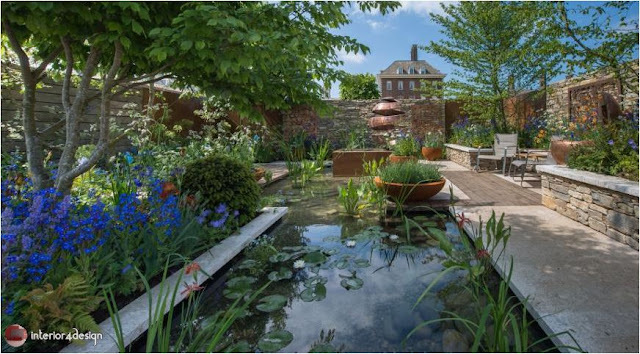 Strict forms of architectural elements coexist with soft planting lines, and a pond in the center of the garden symbolizes the source of water used to produce gin. In the garden, local materials were used - white building limestone, material for laying walls from the island of Purbek, aged oak wood. Garden elements from copper demonstrate the process of creating a drink. Landings in blue, green and copper tones, connecting, create a feeling of calm.